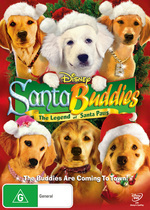 Santa Buddies The Legend Of Santa Paws DVD from DVDLand. B-Dawg, Rosebud, Buddha and Mudbud in a touching twist on a Christmas classic. When Puppy Paws, the feisty son of Santa Paws, forgets the true meaning of the season, its up to the Buddies to remind him that Christmas is not about what you get; its about what you give. Unleash a stockingful of Christmas cheer for you and your family with this fun-filled film, featuring never-before-seen special features. Its sure to be a holiday classic for years to come! Click the button below to add the SANTA BUDDIES to your wish list.